This phase 1 breakfast is perfect for Fall, or the holidays. Something about cloves makes me think of Christmas. 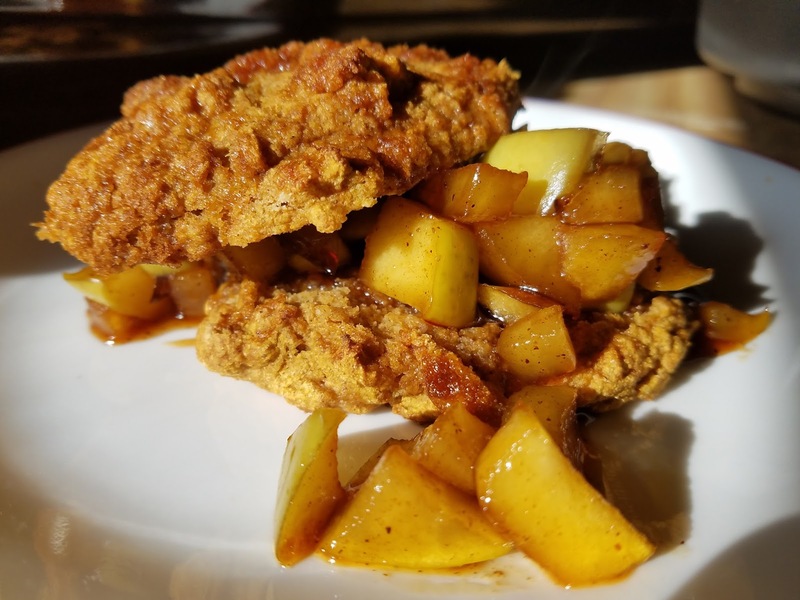 You can bake the apples ahead of time, and mix up the biscuit dough the night before, so all you need to do is pop the biscuits in the oven and warm the apples for breakfast. You can adapt this easily for P3, just change the apples to peaches or cranberries, and use almond milk instead of brown rice milk. Mix all the dry ingredients together. Add liquids and pumpkin and stir. Add enough extra milk to make the dough very moist. You want this dough to not be pourable, but not be dry like a rolled biscuit dough. Let the batter sit for 10 minutes or overnight. Spoon into 4 equal portions and bake at 425 for 9-12 minutes. Dice the apples, stir with other ingredients and bake in a baking dish for 20-25 minutes until soft. Cut 2 biscuits in half and spoon half of the apples over them. Eat while hot. If I use sprouted spelt, do I still use the vinegar? Thanks! Haven't made these before....putting them on the menu for next week!